In Part 8 of the Habits of Mastery, I introduced the concept of becoming “other focused.” To truly serve others we must embrace the Golden Rule because we are compelled to, not because it just makes sense. transaction or hedge play. You “do unto others as they would want to be done unto” because you actually care deeply about them. When we act in this manner we find dignity, grace and meaning in our service to others…even during the greatest challenges of our lives. This is what Victor Frankl found in a concentration camp, beautifully recorded in his book Man’s Search for Meaning. He wrote that he observed how a sense of meaning through service defined who survived and who didn’t. By the way, this practice will also lay the foundation for a positive and great day! As you sow a habit, so shall you reap your character. As you sow a character, so shall you reap your destiny. Don’t be a taker or casual observer. Dive in and be helpful – be part of the solution. It is your obligation to step up and lead. Imagine if everyone developed this habit – what would the world be like? How will you respond during the next minor crisis, or major disaster? Will you hunker down and take care of yourself, or will you be other focused, and serve? I am pleased to announce a new partnership between SOFREP and NavySEALS.com. SOFREP, led by my friend and former SEAL Brandon Webb, will be working hard at developing and adding new content daily to NavySEALs.com, bringing it to the forefront of SOF related digital media. 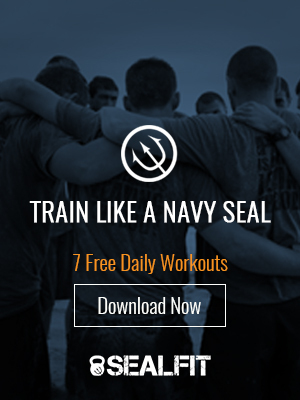 You will still be able to get the same great gear and deals at the NavySEALs.com store. Check it out!